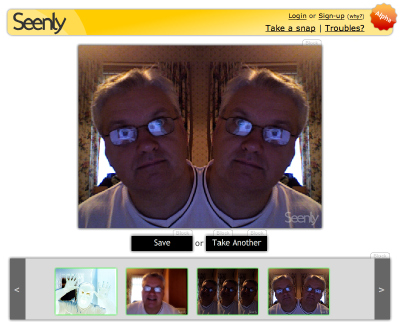 Seenly is a web/Flash-based photo booth service. Like Apple's Photo Booth, which came bundled with models with a built-in iSight cameras, you can take snaps of anything your computer-connected camera can see. Unlike Photo Booth, it can run on any web browser with Adobe Flash installed so you can use it on any Mac or PC equipped with a video camera. As well as a straight video capture, you can choose an effect to apply to the image and this is displayed in live mode so you can see what you're getting. The effects are Black & White, Negative, Sepia, Soft, X-Ray, Artsy Fartsy, Three-Slide, Mirror and Lomo 9. It's a fairly simple web page. After you allow it access to your camera, you get a live video image with options to select an effect or take a picture. Once you've taken a snap, it gets added to a roll at the bottom and you get the option of saving it or taking another snap. Saving the shot saves it to Seenly's server and you don't get the option to save to your own hard disk but you do get a link to the web page and a link to the saved image so you can share your images out with friends. They say they might remove snaps not taken by a registered user that haven't been viewed for over a year but if you sign up, it's free, then your snaps won't ever be deleted as long as your account exists. There's also a Facebook application version that performs just like the full version and your shots can be posted to your profile or sent to friends. Like most computer cameras, lighting can be an issue and I found my own shots a bit on the dark side. That's my problem though but Photo Booth can simulate a flash effect to brighten up a dark shot so it'd be nice to see that added in the future. Brilliant stuff! I've been looking for something like this for some online communities I run for the design/marketing scene in Edinburgh. Thanks! Shame it doesn't automatic place them into flickr etc. Over 45 special effects and you can edit your photos once you've taken them with piZap and Foto Flexer, share them on Facebook, download them etc.